In recent years, ideology, especially right-wing ideology, has been the dominant factor in congressional elections. But historically this has not been the case. Voters mostly looked for simple competence in their representatives and senators—doing the job they were elected to do. First among these is passing a budget. Passing a budget used to be a relatively straightforward job. In January, the president would submit a proposed budget listing every line-item in the budget—all the specific things funded by the federal government that required an appropriation. Congress would adjust these numbers up or down as it saw fit and the House and Senate would finish their work by July 1, when the new fiscal year began. For historical reasons, Congress has divided the appropriations into 12 separate bills, each having its own subcommittee on the House and Senate Appropriations Committees. The chairmen and ranking minority party members of these subcommittees were so powerful they were called “cardinals” because they could direct billions of dollars annually to whatever program they chose. Once a line item for a program had been established by one of the authorizing committees, funding was virtually assured. The less senior members of the appropriations committees also shared the wealth. I remember back in the 1980s, a friend of mine on the House Appropriations Committee staff told me there was an unwritten rule that every member of the committee had $10 million per year to spend on whatever they chose, no questions asked. No wonder seats on the appropriations committees were highly sought after. In those days, voters fully expected their representatives to “bring home the bacon.” That is, to find ways of getting the federal government to fund needed construction projects in the district or establish new offices or military installations that would bring jobs and income. Among the most skilled at using the appropriations process to enrich their districts and buy themselves reelections were Southern Democrats. Since the beginning of the nation, down to the present day, the South has been the poorest section of the country and most in need of federal aid. It’s important to know that historically Congress appropriated the vast bulk of all government spending. Today we call these “discretionary” programs, much being for national defense. Until Social Security was established in the 1930s, the only “mandatory” programs, which did not require annual appropriations, were interest on the debt and veterans’ benefits. As recently as the early 1960s, discretionary programs accounted for two-thirds of federal spending. But after establishment of Medicare in 1965, more and more of the budget fell into the mandatory category. In fiscal year 2013, mandatory programs accounted for two-thirds of federal spending and discretionary programs accounted for one-third, roughly divided 50-50 between defense and domestic programs. Republicans, who control the House, generally give a pass to defense and security-related programs, concentrating all their attacks on domestic discretionary spending. That totals about $600 billion; a lot, to be sure, but just 16 percent of all federal spending. If every one of these programs were totally abolished, instantly, it would not be enough to balance the budget. Curiously, even as the part of the budget covered by annual appropriations has fallen, it has been harder and harder for Congress to do the one thing it has to do each year and fund the government before the beginning of the fiscal year. In part this is because in 1974 Congress layered a new budget process on top of the appropriations process that had worked fine for almost 200 years. Now instead of getting right to work on appropriations bills after the president’s budget comes out, Congress debates the broad outlines of the budget and establishes guidelines for the appropriations committees to follow. Because this is time-consuming, the beginning of the fiscal year was moved from July 1 to October 1. In the almost 40 years since, it has become harder and harder for Congress to finish its budgetary work before the new fiscal year begins. Now it often must pass omnibus “continuing resolutions” to fund the government instead of the 12 appropriations bills it is supposed to enact. The result has been less and less oversight of federal spending, with programs that should be axed continuing indefinitely while urgent national priorities are starved for resources. Instead of going through the budget line by line and making necessary adjustments, programs have been cut across the board via “sequestration,” which cuts vital programs as well as those we could easily live without. At a minimum, this is incompetent budgeting. No one in their right mind would run their own budget this way. One consequence is that the appropriations committees have lost a considerable amount of influence. They now have little control over the spending in their jurisdiction because various budget deals have put so much of it on automatic pilot. Another thing that’s been lost is the ability of individual congressmen and senators to do as much as they used to do to help their constituents. 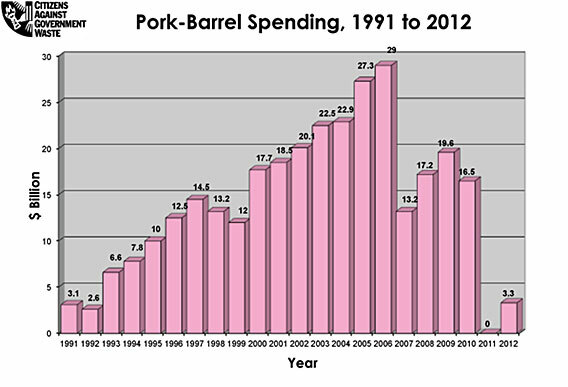 Pork barrel spending is now universally condemned as evil, even though it accounted for just $29 billion at its peak in 2006—about 1 percent of federal spending. According to Citizens Against Government Waste, a watchdog group, there was zero pork in 2011 and just $3.3 billion in 2012, a percentage of spending close to zero. A critical result of the abolition of pork from the budget is that the congressional leadership lost an important tool for cajoling members into making difficult votes. Loyalty could often be bought for the price of a new road or bridge or dam in someone’s district. The inevitable result is the chaos we have seen over the last two weeks. One interesting result of the final budget deal on Wednesday was the reappearance of pork. The Fiscal Times has identified billions of dollars of spending that was the grease to make a final deal. I think this is a good thing. Congress desperately needs to get back to the regular order and get its budgetary work done on time. If cuts need to be made, make them through the appropriations process rather than using a meat-ax to cut every program. Congress was elected to make judgment calls about what programs to fund and which ones not to. It hasn’t done that job properly in years.